Plextor PX-B120U USB-Powered External Blu-ray Drive | OhGizmo! Last week Plextor made things a bit easier for HD movie buffs lacking a Blu-ray drive on their laptops with their new PX-B120U external Blu-ray/DVD/CD drive. Now it’s not the most compact external optical drive on the market, and the top-load design makes it look like a relic from the 90’s, but what sets this drive apart is the fact that it can be powered by a single USB connection. So if you intend to use it when traveling, you can leave the AC adapter at home. 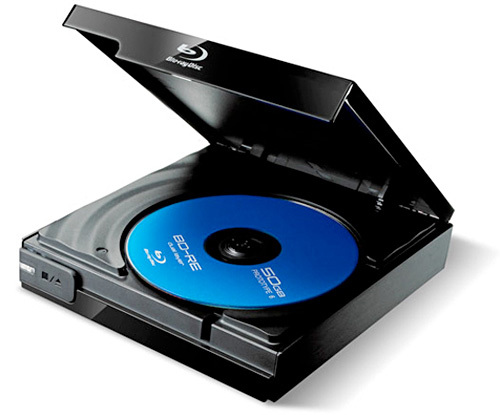 The drive comes bundled with Cyberlink’s Blu-ray and DVD software, and since the decoding is handled by your computer, you’ll need to ensure you have a system capable of HD playback before being able to enjoy Blu-ray content. It also has a reasonable MSRP of just $99.99, and can be used in conjunction with the company’s upcoming PlexMedia media player, turning it into a home theater Blu-ray player as well. That is pretty neat, my favorite feature is definitely the “top-load design”! No jokes aside I really like that it is only powered by one USB. For a portable Blu-ray drive that is a nice feature. Although come on, how many times have you been traveling and wanted to watch a Blu-ray. Ehh i guess its pretty decent…but the whole blue ray experience was meant to be experienced at your home with your surround sound system not on the road with your kids screaming their heads off wanting to watch disney movies all the time…dont get me wrong disney movies rock!! but im just saying i wouldnt carry this around let alone buy it. where can i buy this usb driver for my pc ? do you have a link to check it out . Very handy! I think it's worth the price. That portable external blu-ray drive is really cool and really affordable. The drive comes bundled with Cyberlink’s Blu-ray and DVD software. You can find some of these in amazon and ebay.